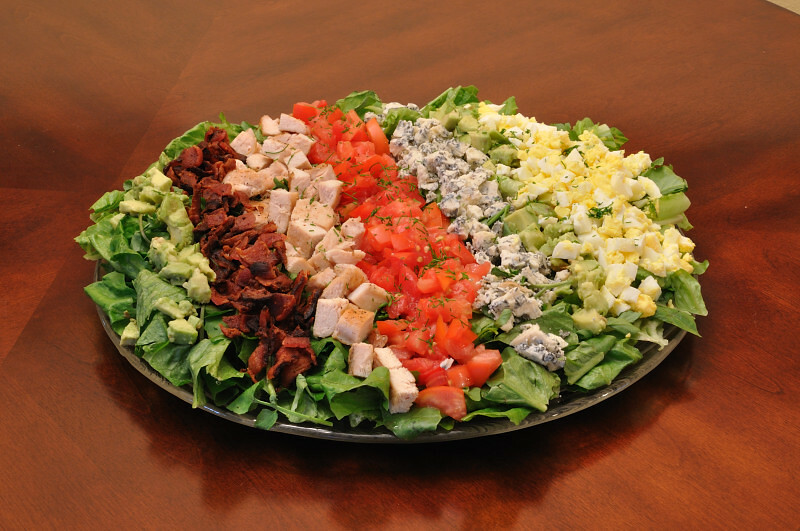 basically a huge cobb salad. very old hollywood & oh so pretty. while ours isn’t entirely authentic (we weren’t going to buy three kinds of greens before we left for a week’s vacation, and blanching tomatoes just to peel them a little ridiculous here) it was, in fact, every bit as delicious. 1. add all the dressing ingredients to a blender pitcher and puree until thoroughly combined. set aside. 2. grab your largest platter & arrange the romaine and watercress to cover the entire platter. now roll up your sleeves and arrange the blue cheese, bacon, eggs, tomatoes, chicken & avocado in nice big stripes across the platter. the best way to do this is with your hands, so dig in. 3. season with salt & pepper, drizzle with prepared dressing & sprinkle the mixed chives all over the top. This entry was posted in chicken & poultry, entrees, salads and tagged avocado, bacon, cheese, chicken, eggs, tomatoes. Bookmark the permalink. I would like to eat this, please. It looks like an Easter egg…pretty! Love the new look! Trying my hand at some Cajun food tonight, hope to do you proud!